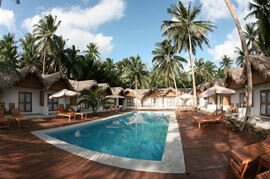 Well-positioned in Donsol - Sorsogon, Elysia Beach Resort is the ideal point of departure for your excursions in Bicol. Only 50 km away, this 4-star hotel can be easily accessed from the airport. A haven of rest and relaxation, the hotel will offer total renewal just steps away from the city's numerous attractions such as Donsol Whale Shark/ Butanding Interaction, Astillero of Donsol, Dancalan Beach.